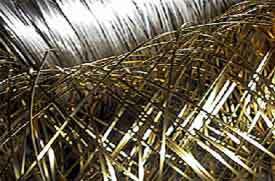 Brass wire is utilized to produce fasteners, screws, bolts, nuts, supportive products, zippers, eyelets and machinery. It is commonly applied for the creation of fasteners, bolts, screws, eyelets, zippers, machinery, rivets, round, square, hexagonal, triangular, half round, custom shape configurations made to blueprints with exacting tolerances and specifications in straight zinc/copper alloys, or copper blended to alloy with nickel, lead, aluminum, phosphorous alloys depending on specific applications required. Available Shapes: Round/ Hexagonal/ Square/ Flat/ Special shapes custom made to your blueprints.